The Tag Heuer brand has an impeccable pedigree that goes all the way back to nineteenth century and across the Atlantic to Switzerland, where Edouard Heuer opened his first watch shop. Could there be any better place for a watch brand to be born? The Formula 1 Men’s Watch WAH1110.BA0858 is a continuation of Heuer’s dedication to innovation and precision; this is a timepiece equal to any challenge. Durability is the name of the game with Tag Heuer’s WAH1110.BA0858. A stainless steel case and bracelet plus a black PVD titanium bezel and a fold over push button clasp equal a watch ready for any adventure. Lost in the Andes? The Formula 1 displays hours, minutes and seconds, so you can calculate exactly when that helicopter will arrive. Marooned on a deserted island? There’s a calendar function; you won’t have to count scratches on a coconut. Even better, this timepiece is water resistant up to an impressive two hundred meters, so you can go pearl diving! Truly, this is a watch at home on any explorer’s wrist. Since this beauty costs over a thousand dollars, the Formula 1 is probably not the watch for starving artists or liberal arts students, but for customers willing to shoulder the expense (and a hiking backpack) this is a great investment piece guaranteed to outlast your wanderlust. For those willing to invest in a true collector’s piece, Tag Heuer offers the Grand Carrera Chronograph Calibre Men’s Watch CAV511B.FC6231. With a brown crocodile leather strap and silver guilloche dial, this timpiece might not be appropriate for outdoor exploration, but it will certainly make a splash in any business or social venture. Tag Heuer’s reputation for precision timepieces has earned it the privilege of being the official timing service provider for a number of high-profile sporting events, including the Olympic Games, the FIS Ski Cup and the FIA Formula 1 Championships. That means that you can slip the Formula 1 WAH1110.BA0858 on your wrist and go, confident that your watch will keep up with your busy life. 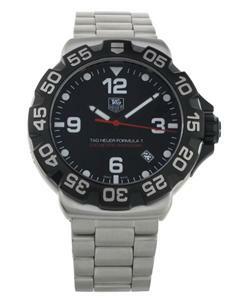 Tag Heuer can handle your archeological explorations, your dangerous spy missions and your trip to visit the in-laws. And really, how many watches can handle your in-laws?